Are you an awakening soul, ready to remember who you truly are? Are you ready to KNOW that you are an eternal, immortal creator being of magnificent power? Are you ready to live the life that goes with loving yourself magnificently and knowing in each moment that you are creating your reality? And that all is flowing in perfect, divine, right order? to stand in the power of their own divine Light. My name is Arn Allingham, but I write and publish books under the pseudonym "Zingdad". There's a cute little story behind the name "Zingdad". Find out what this name means, why I use it, and all the other questions people often ask me, by reading the Introduction to Arn "Zingdad" Allingham. This website is not for everyone and I don't try to pretend otherwise. Only those who are on the path of their own spiritual awakening will be interested in what is here. And those who have (and those who are ready to) understand that truly All is One, will most deeply resonate with my offerings. But, irrespective of whether you are only just beginning to awaken spiritually, or if you have been engaged in an ascension path for decades, you are sure to find what I have to offer to be of great value on your journey. Discover more about spiritual awakening and ascension... and find out if YOU are an awakening soul by completing a fun questionnaire here. Did you know that there are different kinds of awakening souls? In the main... Earth Souls, Star-Seeds and Light-Bringers. Read more... and find out which type YOU are here. As I, myself, awaken, I find it serves my soul's purpose to assist others to awaken. I share what I have learned, heal others as I have found healing and give back to life all the good that it has given to me. This website is the portal through which I do this. On this website you will find the books I have written and published. You will also be able to read draft chapters of the books that I am still working on. A great place to start is with Book 1 of The Ascension Papers. The e-book version is free so you can just go ahead and download it and get reading right away! And, of course, if you prefer, there is a paperback version available too. If you are an awakening soul, then this book will change your life. Perhaps the most exciting thing happening on my site right now is the release of a body of information produced in conjunction with Adamu, who speaks for the Pleiadian Monadic Entity. 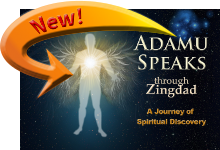 This will be of particular interest to Starseeds but also to all of humanity as Adamu is providing crucial information that you can use to understand the world situation and to learn to navigate your life to the outcomes your soul desires. I am sure anyone who is willing to engage a little playful curiosity will find Adamu's gentle, loving wisdom (combined with his fine wit!) to assist in raising their consciousness in surprising and delightful ways. Book 3 of The Ascension Papers is being written through me by Adamu. This is where all the exciting new information is coming to the fore about the Illuminati, their agenda and what we can do to take back our power. Read the available chapters for free! The "Adamu Speaks" material (also all totally free) is a set of videos in which Adamu speaks to you directly through me. This material will eventually become a part of the later chapters of the abovementioned book. And then I'd like to invite you to share my journey with me by reading my blog. I'm sure you will find this is no normal blog! Woven through my personal stories you will find an abundance of useful insights, and consciousness raising content told from the very personal perspective of my own life experiences. Another great place to start is two books written by my dearest friend, Lisa Picard. Lisa presents concepts that will be familiar to readers of The Ascension Papers in a magical and delightful fictional setting. Check out The Green Lady (the e-book version is also free) and The Green Lady, Book II for a real fun treat that is, at the same time, profoundly spiritual and inspiring. Lisa's books really do introduce the reader to the spirituality of Oneness in the most wonderful, lighthearted and easily accessible way. This is perhaps an ideal beginning point for those who are newly beginning their spiritual awakening and also great for teens. But really, these books work on numerous levels of awareness and anyone can read them and love them. But before I tell you about that, I'd like to invite you to sign up for my free monthly newsletter. My newsletter is how I can keep you updated when I release new chapters to books, or indeed when new books are published. It's also how I inform you of new blog posts, videos and anything else that I have to offer that is new and exciting. And if you ever decide that you no longer wish to receive newsletters from me, the unsubscribe link is at the bottom of every single mailing. So it's really all very easy and no-strings attached. But now back to my offerings! Visit my guided meditation page to choose from the selection of audio recordings that I have available. Each will take you on a journey of discovery into your own psyche. Each has a different purpose. Some will teach you the vital tools of connecting with your heart, your Inner-Self or your spiritual guidance. Others will find and heal blockages that result in physical or emotional pain. All serve the greater good of bringing you into closer alignment with the divine within. If you browse the menu bar above you will find a list of books under “Publications”. Most of these books are works in progress. I share the completed chapters since they will already offer you value. There is, however, a completed book to which I would like to draw your attention. I can heartily recommend Create Yourself; Create Your Life to those that are ready to discover the power of their own emotions as a tool that they might use to recreate their lives as they would like it to be. Move directly from victim to creator through the use of the tools and techniques taught in this 30-day experiential guide (with accompanying guided meditations). If you are in need of deep, personal assistance on your journey, I am really quite skilled at showing you to your Inner-Self and helping you to heal the blockages in your psyche that keep you from being all that you truly are. I’d LOVE to help you if you are ready and willing. I specialise in a 1-on-1 healing modality called Soul Re-Integration. I have something of a gift with this as it is something that I "brought in" to this incarnation with me. I'd love to tell you more about this: how it works, what I do and what you can expect to experience. So PLEASE do visit my Soul Re-Integration page to find out more! Another truly soul-deep interaction that I can facilitate for you, but this time without 1-on-1 contact, is the Dreamer Awake! multimedia seminar series. This is my "flagship" offering. I have worked for years on this, packing everything I have learned about spiritual healing, ascension, awakening, connection with the divine within, understanding and healing the Shadow (and in so doing overcoming all the many forms of self-sabotage that we all engage in) and culminating in teaching the Tools of Creation that you can use to recreate your reality in the most delightful way that serves the greatest good of the All. Truly, this is an experiential journey unlike any other. Dreamer Awake! will allow you to heal your self-perceptions and limiting beliefs, move into resonance with the divine within and learn to become all that you truly are... whilst still here on Earth! Check out the reviews. See if this is right for you. Everyone who has engaged with the Dreamer Awake! material raves about it. It simply is ALL THAT! Imagine spending a week (or more!) with me in the paradise I call home. Imagine staying in the most gorgeous little cottage overlooking a lake surrounded by trees. Imagine having your meals prepared from the freshest organic ingredients specifically for your needs and tastes by a trained chef. Imagine each day I come to visit with you for hours of soul-deep interaction. Taking ALL THE TIME WE NEED to go wherever you need to get to all the growth, healing and self-discovery you could possibly want. Imagine meditating together. And imagine we take time out from this by going on uniquely African adventures together, such as walking with Elephants, as just one amazing example. Imagine long lazy conversations by the fire under the stars. I absolutely LOVE the depth of connection and interaction that I am afforded when guests come on Spiritual Safari with me. Imagine the next guest to visit me is YOU! Read all about Zingdad's African Spiritual Safari here. If you still have questions or would like more direct input, then you are most welcome to contact me. I'd love to hear from you and see how I might be of assistance to you on YOUR journey Home to the magnificent Bright Light that you truly are!